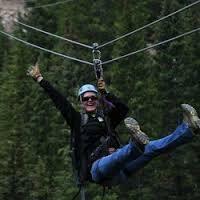 Zip Line year-round at the Top of the Rocky Mountains. 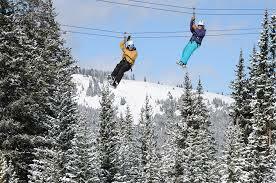 Top of the Rockies Zip Line is minutes away from most ski areas and only 1-1/2 hours from Denver. Leave Interstate 70 at Exit 195, Copper Mountain/Leadville and come south on Highway 91 only 14 miles to our Base. Top of the Rockies is located at the top of the world on 2,500 acres of the comany's private property. The property reaches up to 12,800' on the Continental Divide and is abundant with wildlife, vast forests of pine and aspen, streams and waterfalls. The course has six separate sections with the first zip deck at 11,500' high above the Base Camp. All six sections have double cables and an automatic braking system for smooth and stress-free landings. Professional guides accompany guests on one single zip and four Twin Zips for side-by-side flight. The BIG NUGGET, zip #6 is a triple. Fly down from the rocky cliffs and land on the spectacular 100' tall Sky tower with magnificent views of Mount Massive and Mount Elbert to the south and Mt. Arkansas, an almost fourteener, to the Northeast. Complimentary coveralls and boots are available for winter tours but warm personal apparel is appropriate for this activity. We provide helmets, gloves and all harness and gear. Minimum weight is 50 pounds and maximum is 260. Fly over the Leadville Colorado & Southern Railroad Train in the spring, summer or fall season, or ride the train to our property for zip lining on the 5 hour Rails & Zip Line Combo. In winter combine zip lining with snowmobiling on the 5 hour Thrill-Seekers Combo. No matter what season of the year, we've got you covered for the most exciting tours in Colorado.